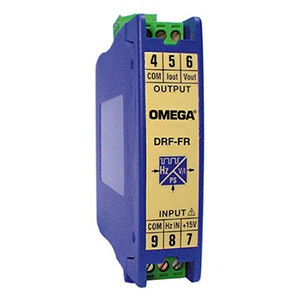 The DRF-FR signal conditioner accepts a frequency input and provides an isolated 0 to 10 Vdc or 4 to 20 mA output. Models are available with three different power options, 24 Vdc, 120 Vac and 240 Vac. The DRF-FR are ideally suited for industrial applications. All models mount on a standard 35mm DIN rail and provide galvanic isolation between input, output and power up to 3500 Veff . Module response time is 250 ms or less. The front door of the housing provides easy access span and offset potentiometers which may be used field adjust the input and output signal range. The ranges shown in the Range Table below are supported. The input, output and power circuits are isolated by 3500 volts of galvanic isolation. The isolation protects against potentially damaging voltages from passing through the signal conditioners into connected systems. The isolation also provides improved measurement accuracy by minimizing the effects of ground loops and electrical noise. Each DRF series signal conditioner is available with current and voltage output (only one may be used at a time). Available output types include 4 to 20 mA or 0 to 10 Vdc. Although pre-configured before shipping from the factory, the output may be changed through an internal jumper change. Standard outputs are linear and proportional to the signal input. Below are examples of popular models. Use the Part Number Builder to order a specific model. 참고: All models come with a complete user's manual.